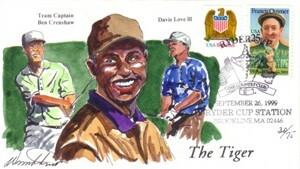 1999 Ryder Cup hand painted commemorative cachet envelope from Wild Horse Cachets featuring watercolor art of Tiger Woods, Ben Crenshaw and Davis Love III. Specially postmarked at the Ryder Cup in Brookline, Massachusetts. #30 in a limited edition of 75. ONLY ONE AVAILABLE FOR SALE.